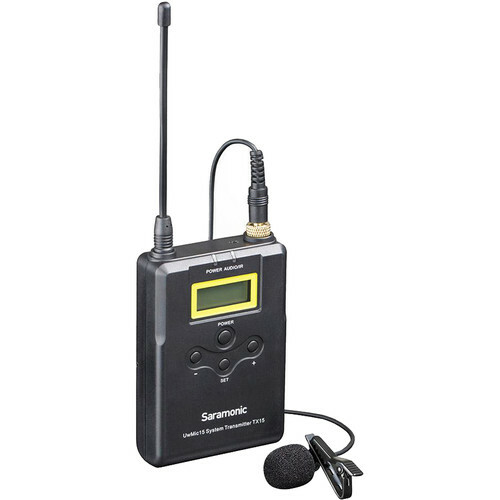 Well suited for broadcast, video, and television production, the Saramonic SR-TX15 is a bodypack transmitter offering easy IR sync and auto-scan configuration when integrated into a UwMic15 wireless system. It provides 16 channels over 24 MHz of bandwidth in the UHF spectrum from 555 to 579 MHz. Use the included omnidirectional lavalier microphone, or connect your own lav/headset mic to the transmitter's locking 3.5mm input jack. 48V phantom power is selectable from the SR-TX15's menu. The backlit LCD shows vital information such as frequency and battery level while LEDs indicate battery status and presence of audio signal. The transmitter's power button also affords simple mute functionality. Power for the SR-TX15 is sourced from two AA batteries (available separately), which fit into the supplied removable battery compartment. A belt clip is included for simple, secure attachment to a belt, pants, or other article of clothing.